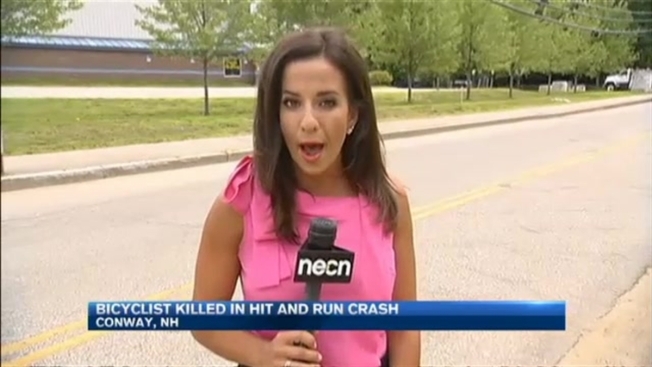 Authorities are searching for the driver behind a fatal hit-and-run of a bicyclist in New Hampshire. Police in Conway are trying to determine whether the deadly crash was a crime or an accident. "The body was between myself and the bike," said Conway resident Ted Ferry. The image of the dead body on his road is something he can't get out of his head. "It was tough," Ferry said. "Tossing and turning all night last night." Ferry lives on West Main Street, right near the spot where police say a man was hit by a truck and killed while riding his bike Wednesday evening. Police Lt. George Walker says the driver took off, leaving 36-year-old Jesse Fulcher critically injured. Fulcher, police say, was a Conway resident known to ride his bike around town almost every day. "He's been here in town for quite some time," Walker said. "An avid cyclist." Because of all the construction on West Main Street, Ferry says a lot of bicyclists are forced to ride closer to the center line. There were no eyewitnesses, so it's taking police a bit longer to figure out exactly what happened, but they have an idea. Walker says Fulcher was hit by a tractor trailer that had finished making deliveries in northern New Hampshire and was driving back to Londonderry. "The transportation company is cooperating fully with us," Lt. Walker said. Police are reviewing surveillance video and say there's a chance this hit-and-run wasn't a malicious crime, but an honest accident. "We have to explore all options and we're doing that but it's entirely possible," Walker said. "The fact there are no skid marks or anything on the side of the road — I can't imagine it's anything other than an accident," Ferry said hopefully. "If it was a big tractor trailer, he might not have even known." Anyone with information is asked to contact Conway Police.